My book just says grow at a temperature of 13 - 18 degrees in autumn or early spring. That's all - you'd be best reading the back of a seed packet for further help! 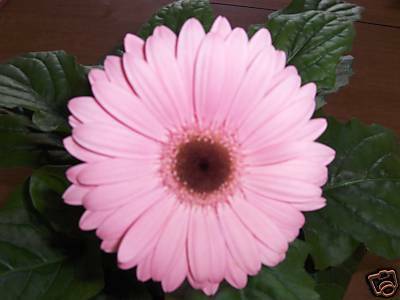 Gerbera plants grown in locations with insufficient light will not bloom well. If you intend to grow a Gerbera indoors, give the plant as much direct sunlight as you can. Six hours of direct sunlight usually suffice in this case and can be achieved by placing it on a sunny windowsill. Do not try to grow it under office lights, since fluorescent lighting, even if placed within close proximity, don't seem to give encouraging results. The Gerbera loves to suntan but it must still be protected from the afternoon sun. The afternoon sun here will very likely fry your plants, hence Gerbera is rarely grown outdoors. They grow pretty fine as potted plants under semi-shaded conditions, like under a shaded verandah or patio, if placed outdoors. Slowly acclimatise your newly bought plants before exposing them to full sun outside. Gerbera thrive well in well-drained soil. The peaty substrate in which a newly bought Gerbera is grown is not suitable for growing the plant on the long term under local conditions. After the first flowers have wilted, grab the opportunity to change the substrate to one which river sand is added to improve its drainage. Never over water the plant and let the soil dry out a little before watering it again. This is especially important if the plant is grown indoors. Feed your plants regularly to encourage flowering. You can use a water-soluble fertilizer for flowering plants - those with a high phosphorous (P) and potassium (K) ratio. Remove spent blooms to encourage further flowering. Remove flower stalks of wilted blooms at the base of the crown, and at the same time remove yellowing leaves, if any, to reduce the possibility of fungus infection.